We took a couple of fun rabbit trails – one artistic, one linguistic – when we learned about early Russian history. Russia (the land of the Rus) derives its name from Rurik, a Viking explorer. Rurik and his warrior tribe settled to rule over the native Slavs in an area north of the Black Sea which became known as the Kievan Rus. The various Rus tribes were ruled separately by different warrior princes – and latterly, the Mongols – for about six hundred years, until they were brought together by a prince named Ivan. This prince – a descendant of Rurik – also freed Russia from Mongol rule. Ivan ruled Russia for many years, and is remembered as Ivan the Great. By the time Ivan the Great’s grandson – remembered as Ivan the Terrible – came to power, the Russians had begun referring to their city “the Third Rome” (after Constantinople). Ivan the Terrible called himself “Tsar”/”Czar”, meaning “Caesar”. After the death of his wife, Ivan the Terrible suffered bouts of paranoid madness, terrorising his people with a vast and vicious network of secret police. Ivan the Terrible even killed his own son – terrible, indeed! The death of Ivan the Terrible in 1584 marked the end of Rurik’s dynasty. Ivan the Great ruled the newly unified Russia from Moscow. There he built beautiful cathedrals inside the ancient fortress known as the Kremlin. 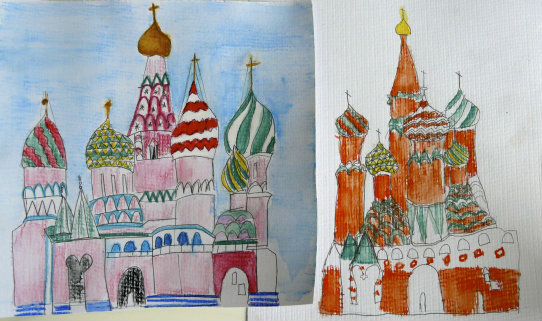 St Basils’s Cathedral, with its colourful onion-shaped domes, is so much fun to draw. 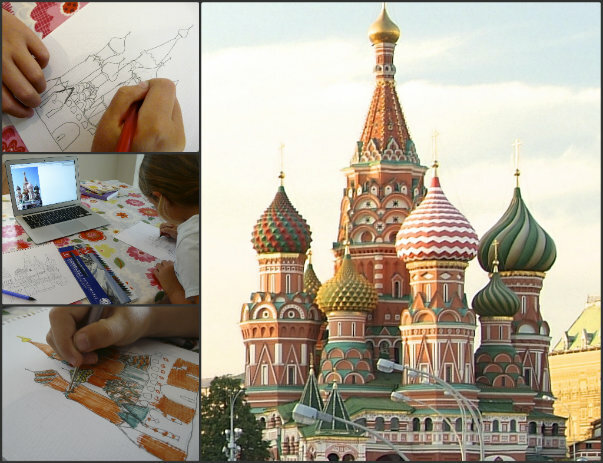 We worked from one of the many beautiful photographs of St Basil’s. Back in the 9th century, the Byzantine Emperor commissioned two monks to bring Christianity to Eastern Europe. To do this, the monks had to transcribe the Bible into Slavic – a daunting task since the Slavs had no written language, and their spoken tongue contained many sounds not found in other languages. One of the monks, Cyril, came up with the idea of creating a Slavic alphabet from a hotchpotch of Hebrew, Greek and Latin. In this clever way, St Cyril’s alphabet – the “Cyrillic alphabet” – was able to represent every Russian sound. 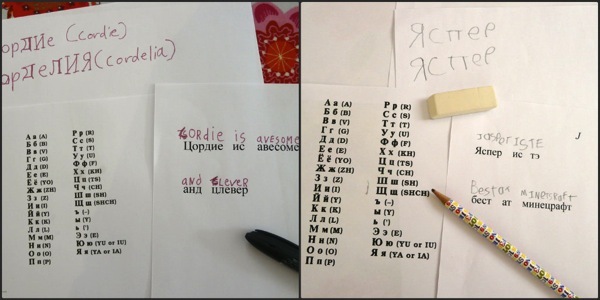 The Cyrillic script is now used by more than 70 languages. We used this fabulous free booklet You Already Know a Little Russian to familiarise ourselves with Cyrillic letters. 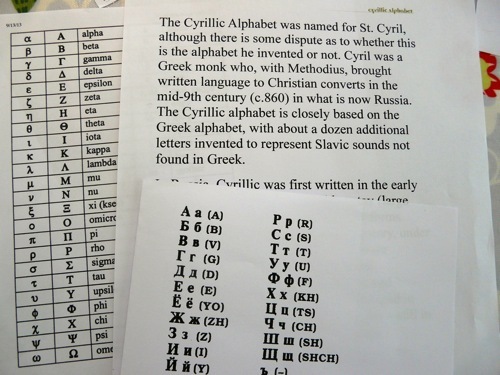 I also printed out the Greek alphabet (which we’ve looked at before) so we could compare the Greek and Russian letters. If you have older kids, you might also look at the Hebrew alphabet. 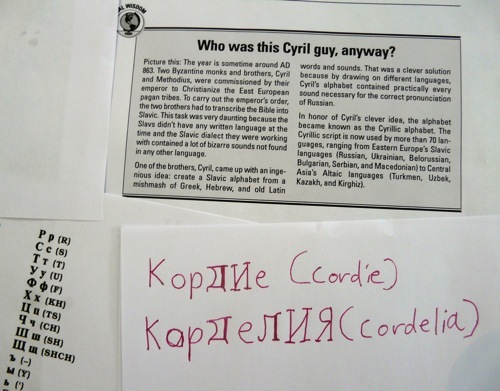 We used an online transliteration tool to convert our names into Russian, then wrote them out. In my next history and geography post I’ll share the fun project we did when we studied medieval Turkey. It even overlapped with maths!